We sell Doves Farm products like Doves Organic Malthouse Bread Flour 1kg online in the UK and directly from our award-winning store in Scotland. A special blend of wheat, rye and barley malt flours with malted wheat flakes. Doves Organic Malthouse Bread Flour is a special blend of wheat, rye and barley malt flours with malted wheat flakes. Ideal for oven baked yeast cookery and in bread machines. wheat flour* (contains GLUTEN), malted wheat flakes*15% (contains GLUTEN), rye flour*3%(contains GLUTEN), barley malt flour 3% (contains GLUTEN), ascorbic acid. This flour is also available in 10kg and 25kg. Please give us a ring for more information. These sizes are 'collect in store' only. As official Doves Farm stockist, we sell genuine Other Flours directly from our shop in Scotland and online throughout the UK. Where can you buy real Malthouse Flour safely online? If you are wondering where you can buy Doves Organic Malthouse Bread Flour 1kg safely online in the UK, then shop with us. We are an actual health foods shop; with real people selling real foods and products. Our award-winning independent shop is located in Stirling, Scotland since 1976. You can buy our Organic flour and other genuine Other Flours in store or safely place an order with us online or over the phone. 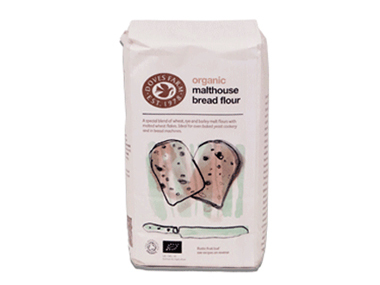 Malthouse Flour - Doves Organic Malthouse Bread Flour 1kg in Other Flours and Baking.